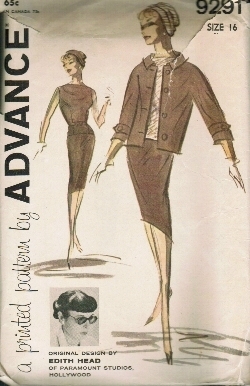 A boxy early 60’s Edith Head pattern: a skirt, blouse, jacket and … Yes … a turban! Suggested fabric: cotton suitings, pique, linen, blends, silk linen, faille, satin, silk tweed, wood crepe, tweed, flannel, jersey, blends. Hmmm, quite a bit of variation allowed. Ohhh, the stash will be searched extensively!!! I’ll have to grade up 2 sizes but i think I can do that without too much trouble. I have a grading tool I’ve never tried before. 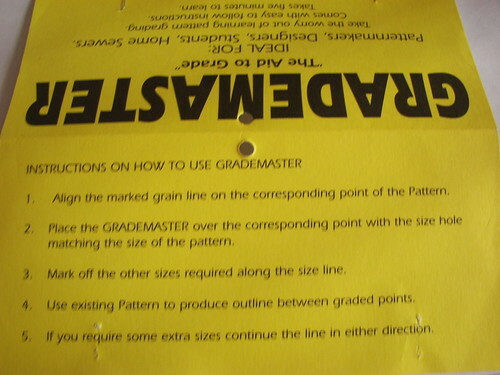 Our dear Fashion Incubator author, Kathleen Fasanella, ALMOST reviewed it in 2006 in her post on Grading Machines and Rulers and it was ALMOST discussed in 2004 at Pattern Review: Pattern grading ruler: New gizmo!! but it was the Gizmo not to be reviewed so I’ll give it a bit of description here. I tried to find an active link for retail purchase of this Gismo but there doesn’t seem to be one any more. Not to worry, I don’t believe it is worth the money I spent on it and I’ll give you links to probably much better sources. 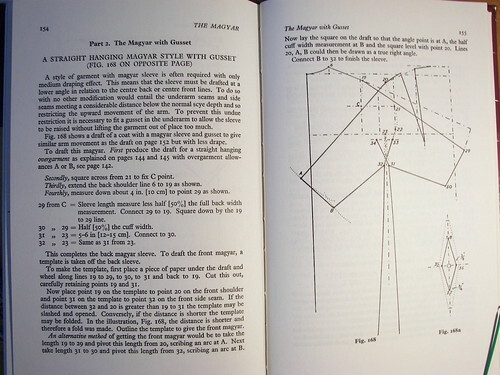 This Grade Master is ridiculously simple and helpful mostly because it shows how the grain line should be lying under the clear Plexiglas. 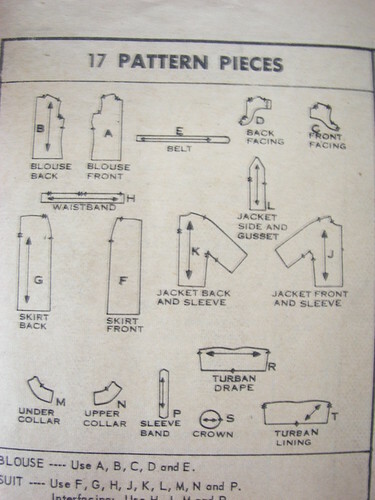 But other than that it is a simple procedure of extending incrementally to the seam line: (measuring visually) it is 6mm at the collar end, center front and back, neck point front & back, and sleeve crown; 5mm at the sleeve head (which, I believe,means at the width of the sleeve cap), 3mm at the cuff and 12mm to the side seams. Calipers would be more accurate than my eye but since this little tool is unavailable I think this approximation should suffice. 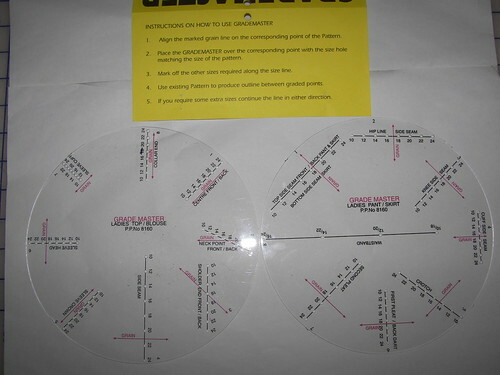 Different drafting tools and systems most likely will have different increments and I’m sure most readers would like to hear about your particular system for grading, if you care to share in the comments. 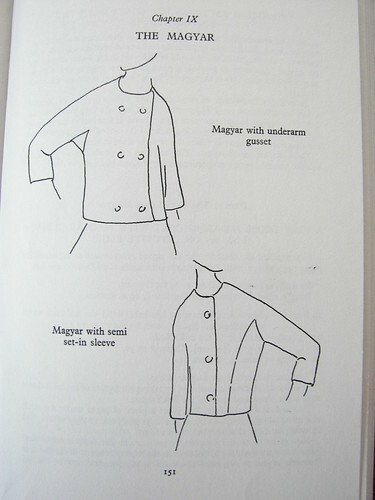 Posted in Fashion, Pattern Reviews, Sewing. Bookmark the permalink. Sorry I wasn’t more helpful Mary Beth. I never did buy one. Don’t remember what I thought was the problem, either cost or shipping or maybe a combination of both. Which is not to say I wouldn’t want to look at yours up close. I click on the photo and it tells me I don’t have permission. I can’t wait to see this outfit made up. I love the style. Okay, is there some sort of turban revival happening? Check this out: http://kuki.deprada.net/?p=601 – is that not a great-looking quasi-turban? Turbans I will have to mull over for a while I think. I’ll be curious to see you wearing yours!! I look forward to seeing how that turban works out, I hope you will share the results with us. Sounds like a great new adventure! I’ll be interested to see how this one turns out, turban and all. Mary Beth .- ahhhh … that joy to see this link. Cristina is one of my best friends .. This afternoon we were together. That suit will be terrific on you Mary Beth! And I’d love to find an easy to use grading tool.